Every gambler as well as casino employee is aware that there are many cheating methods related to each casino game and successfully used by particular talented players especially in the past. Why in the past? Well, probably the reason is that casinos have become more prudent of players' cheating and now they use various methods and devices aimed on detecting and revealing dishonest gamblers. As it was already mentioned previously, casino cheaters invented particular kinds of cheats for every game and even its variations. For instance, roulette cheaters would definitely use past posting method, pinching or top hatting as well. 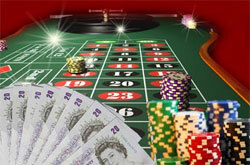 The method of Past Posting implies the situation when a roulette player manages to add chips during the game to the winning number as well as remove his chips from the number that lose after the ball is already in the roulette wheel. Everything a player should do while performing the post posting cheat is to distract somehow for few seconds a roulette dealer's attention. For this purpose it would be more advantageous for a cheater to have a partner. Before a number will be marked by dealer the cheaters have few seconds to change the quantity of the chips they had on the most profitable. The dealer's attention can be distracted by the sudden din not far from him provided by the partner, etc. The far table's end is the perfect position for past posting. Of cause, players also can draw dealer's attention away from what one of them is doing by simple conversation, especially if one of the cheaters is a beautiful woman. Actually those gamblers that used past posting managed to invent the most sophisticated situations for dealers. To perform the past posting successful the players need perfect eyesight in order to see numbers on such distance. Moreover, those cheaters probably possessed a talent of the hand dexterity as it is really hard to get the chips or add them secretly. Nowadays the performing of this method at the casinos is almost impossible as there are many various cameras (including those with movement detectors) which reveal the cheat with 99 % assurance.